Occupied Ramallah, 28 April 2012 -- Palestinian civil society warmly welcomes the declaration of the Arab Youth and Sports Council of Ministers in support of a boycott of Adidas due to its sponsorship of an Israeli marathon that violates international law and whitewashes Israel’s illegal occupation of Jerusalem. Particularly praiseworthy is the consequent decision by the Egypt Football Association to boycott Adidas despite the financial penalties it will incur as a result of doing so. 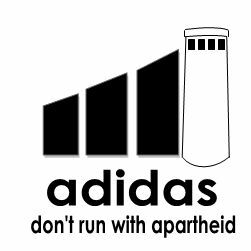 The BNC calls for an international boycott of Adidas until such time as it ends its involvement in the so-called “Jerusalem Marathon” as well as in any other Israeli events that serve to whitewash Israel’s ethnic cleansing of the city and violations of international law. The UN has consistently maintained that “any actions taken by Israel, the occupying Power, to impose its laws, jurisdiction and administration on the Holy City of Jerusalem are illegal and therefore null and void and have no validity whatsoever, and calls upon Israel to cease all such illegal and unilateral measures.”  Adidas’s partnership with the Israeli Jerusalem Municipality, the main organ of the occupying Power, on east or west of the city, clearly violates this resolution. The Palestinian BDS National Committee (BNC), the broadest coalition of Palestinian mass organisations, political parties, trade unions and networks, had revealed in 2011  Adidas’s complicity in Israel’s so-called “Jerusalem Marathon,” which illegally passes through occupied East Jerusalem and serves to strengthen Israel’s grip on occupied Palestinian territory, calling on the company to withdraw its sponsorship of the sporting event. After failing to heed this call by Palestinian civil society and in light of the striking revival of popular boycotts of Israel in the Arab region as a result of the evolving popular revolutions in the region, Adidas has now become a target for boycott across the Arab world, which will undoubtedly lead to massive loss of revenue. The price of complicity in Israel’s violations of international law has increased sharply, thanks to the Arab Spring and the spectacular spread of the BDS movement globally. "The similarities between the situation of East Jerusalemites and black South Africans [are] very great in respect of their residency rights. We had the old Group Areas Act in South Africa. East Jerusalem has territorial classification that has the same sort of consequences as race classification had in South Africa in respect of who you can marry, where you can live, where you can go to school or hospital." Far from meeting its stated commitment to “rules that society expects of a responsible company”, Adidas has knowingly chosen to assist Israel with whitewashing its ethnic cleansing of Jerusalem and indeed its entire system of occupation, colonisation and apartheid. The Palestinian BDS National Committee (BNC) therefore calls on people of conscience around the world to boycott all goods manufactured and sold by Adidas to hold it accountable for its complicity with Israel’s grave breaches of international law.